This is such a fabulous option for a healthy carbohydrate side dish. Chickpeas (also known as Garbanzo Beans) soak up the flavors well and they have a great buttery flavor. This all helps to make the salad taste flavorful and rich. This salad is punched with boldly flavored ingredients, so it makes it possible to get away with using a small amount of each while still packing in great taste and low fat. The fresh mint, feta, and olives add plenty of zest to this salad. I’m sure this salad would be delicious served over a bed of greens with whole-wheat pita chips. Add in a little grilled chicken and you’ll have yourself a full meal! Whether you eat this as a side dish or as a main course, I hope it offers some variety that you’ll love. 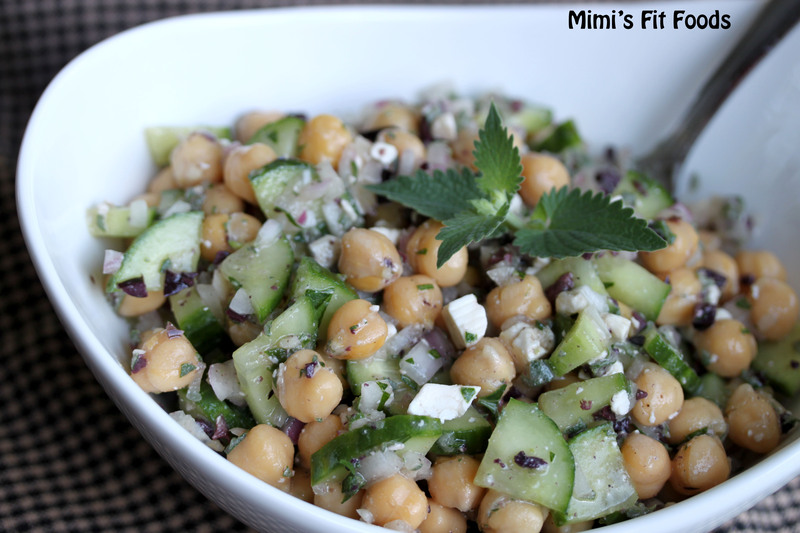 Toss the chickpeas, onion, cucumber, mint, feta, and parsley together in a large bowl. In a separate bowl, whisk the lemon juice, olives, mustard, oil, and garlic together, then pour over the chickpea mixture and toss to coat. Season with salt and pepper to taste and serve.